Botswana is a stable, peaceful and relatively prosperous country, home to vast game reserves where some of the largest herds in southern Africa roam free, together with the most spectacular and varied bird life. The tropical climate greets you with blue skies, sunshine and cooling breezes. As you travel through Botswana, you discover a land of contrasts. The Okavango Delta forms the nucleus and heartbeat of this treasure house of wildlife. Explore the area on foot, in a 4×4 or on a traditional mokoro (canoe). In sharp contrast, but equally fascinating, you can also visit the vast white salt pans and the grasslands of the Makgadikgadi and Nxai Pans, or the seemingly endless Kalahari Desert with its orange sand and scant vegetation. In the north of Botswana, you’ll find the dense bush and broad floodplains of Chobe National Park, home to the largest concentration of elephants in Africa. A safari in Botswana should yield plenty of elephant, buffalo, red lechwe, giraffe, hippo, lion and cheetah. The country also has the largest remaining population of the endangered African wild dog. Over 500 species of birds have been identified along with reptiles and smaller mammals. The people of Botswana will extend a warm welcome to you. Size: Botswana covers an area of 31,802 square miles, slightly smaller than Texas and slightly larger than France. 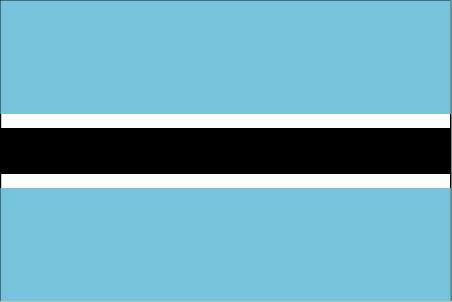 Population: Just over 1.5 million people live in Botswana. Languages: You will most likely hear English (the official language) as well as Setswana which is spoken by most people in Botswana. Currency: For safari purposes, the US $ is widely accepted at lodges and camps, but the local currency is the Pula ±1:USD5. Pula means “rain” in Setswana, which (like money) is scarce & valuable. Getting to Botswana: For safari destinations, main points of entry are: Maun (MUB) or Kasane (BBK), served by Air Botswana (to/from Johannesburg, Victoria Falls, Windhoek) & South African Airways (to/from Johannesburg). You can also travel by road from Victoria Falls, Zimbabwe or by road & boat from Livingstone, Zambia. Read more about this region’s rather confusing geography! Books: No.1 Ladies’ Detective Agency – Alexander McCall Smith, Cry of the Kalahari – Mark James Owens; Back Seat Safari – Robyn Keene-Young; Botswana Time – Will Randall. North of the Okavango Delta and occupying 4200 square miles is Chobe National Park, the second largest in Botswana. This park has a variety of habitats ranging from the verdant floodplains, grasslands and thickets bordering the Chobe River, to forest, mopane woodland and scrub. The original inhabitants of this area were the San people. They were hunter-gatherers who moved from one area to another in search of water, wild fruits and wild animals. A major feature of Chobe National Park is its elephant population. The Chobe elephants comprise part of what is probably the largest surviving continuous elephant population in the world, estimated at about 100,000. Chobe is also home to buffalo, hippo, lion, leopard and hyena. Game viewing here is by open four-wheel drive vehicles as well as in small boats on the river. Game viewing is at its best during the dry season (April – October), when the majority of natural pans have dried up. Savuti is an arid region located in the southern part of Chobe National Park. Bisected by the Savuti Channel, this strange waterway seemingly has a mind of its own. After remaining dry for 100 years, it abruptly flooded again in the 1950’s and remained flooded until the early 1980’s, when subterranean earth movements caused it to dry up once more. Savuti has open plains which are the permanent home of elephant, lion and spotted hyena. Large herds of Burchell’s zebra visit the region in late summer (February – March). The Okavango Delta is formed from rains that fall over 600 miles away in northern Angola. This life-giving moisture travels down the Okavango River and spills out onto the Kalahari Desert creating the world’s largest inland delta. It has marsh, river, grasslands, and riverine forest of palms, islands, flood plains and lagoons. Here dry meets wetland. A rich tapestry of channels flowing with crystal-clear water, the Okavango Delta stands as an oasis within a surrounding desert landscape. Over 1100 species exist in this beautiful and exceptional wilderness. A visitor can explore the maze of water passages in a mokoro, gliding among palm-fringed islands, watching hippo grunt and splash in the pools. Or one can view the wildlife that live at water’s edge in the Moremi Wildlife Reserve from a vehicle or on foot. With the seasons marked by the ebb and flow of water, the Okavango Delta hums to the rhythm of nature, which can be observed in all its glory. Maun, a transitory town popularly known as the gateway to the Okavango Delta or the hub of the tourism industry is one of the country’s busiest centers. It has grown in leaps and bounds with the increase in tourism to the region. Flights from Gaborone, Victoria Falls, South Africa and Windhoek arrive daily into Maun International Airport. In addition, there are many charter services, which take travelers into the Delta. Within a few hours travel from Maun, tourists can find themselves in the Okavango Delta, Moremi Game Reserve, Kalahari Desert or Chobe and these areas are the heart of Botswana’s tourism. Makgadikgadi National Park offers endless vistas of rolling golden grasslands and its huge saltpans … with desert palms lining the horizon. This 4500 square mile park is directly south of Chobe National Park. It consists mainly of fossil pans and the famous Baines baobabs. The floor of some of the pans is vegetated with palatable grass species – an important source of grazing to animals such as zebra, springbok and impala. The southern section of the park consists of saltpans and grass plains (which are) believed to be the remains of an ancient lake. The pans, situated in half the south, east and northeastern areas of the park, fill with water during the rains from mid-November and mostly retain their water into April or May. During the rainy season these “thirstlands” are transformed into great sheets of water that attract a spectacular array of waterbirds and trigger dramatic migrations of wildebeest and zebra. The Makgadikgadi remains a spectacle to visitors both when dry and wet. For a truly unique safari adventure during the dry season, (four-wheel drive) quad bikes are used to venture far into the middle of the Pans to explore remote archaeological sites. In the wet season, the water attracts flamingos, pelicans, ducks, geese and many other migratory water birds in their thousands. Herds of wildebeest and zebra are common during the wet season, but spread out in the grasslands of the Makgadikgadi and move to the Boteti River for water during the dry months. 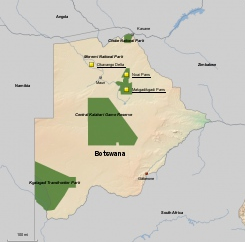 This last great true wilderness of Africa is a vast desert region covering some 80% of Botswana. The Deception Valley of the Central Kalahari is one of the remotest areas in the Kalahari. The Game Reserve is the second largest in Africa covering approximately 32,000 square miles of pristine wilderness and is the largest open eco-system remaining in Botswana. To explore the area is to travel back to an Africa of another time. Deception Valley is host to huge herds of gemsbok, springbok, wildebeest and hartebeest attracted to the area by the flush of sweet grasses that flourish in the ancient valley following the rains. There is also a good chance of seeing the Kalahari lion, cheetah, brown hyena and meerkats, made famous by Mark & Delia Owens who undertook an eight-year research program into the desert predator ecology in the valley. As such, their book, the ‘Cry of the Kalahari’ makes essential reading for anyone undertaking a visit. The best time to visit is March to May, after the rains, when the Kalahari awakens with life. At this time, large concentrations of plains game and large numbers of birds can be seen. The Linyanti Wildlife Reserve, bordering on the western boundary of Chobe National Park consists of 125,000 hectares of unspoiled wilderness. Open grassland, riverine forest, mixed terminalia woodland and the dry Savuti Channel characterize most of the area. The area is most noted for its very large elephant populations, which can reach enormous densities in the winter months. Impala, lechwe, kudu, zebra, giraffe, sitatunga, sable, roan, waterbuck, buffalo, bushbuck and the smaller antelope are all found here. The major predators, such as lion, leopard, cheetah, wild dog and hyena, are resident and regularly sighted. The reed and papyrus swamps are ideal for numerous and diverse species of birds, ranging from the fish eagle to waterfowl, cranes, storks, plovers and herons. Selinda Wildlife Reserve is a private wildlife area located to the northwest of Savuti. This area covers some 800 square miles along the Selinda Spillway, which links the Okavango Delta to the Linyanti Swamps. These papyrus marshes are home to crocodile, hippo, sitatunga and lechwe. The birdlife is prolific and varied, especially in the riverine areas. Game viewing is exceptional with sightings of lion, cheetah, wild dog, leopard, elephant and buffalo, to name a few. Nxai is the northern-most vestige of the super lake that created the entire Makgadikgadi complex. As such it is essentially a saltpan, which has been entirely reclaimed by the savannah grasses. The pan itself is host to huge numbers of springbok, gemsbok and even impala, and in the wet season zebra and elephants migrate into the area and frequent the pan. As such, it forms a stark contrast with the serene tranquility of Ntwetwe Pan, south of the Makgadikgadi area. There are also good populations of giraffe, kudu and lion in the area and a good chance of seeing leopard, wild dogs and cheetah.